This event will showcase the New York City Premiere of the award-winning documentary film Flying Paper, co-directed by Professor Nitin Sawhney (faculty, School of Media Studies) and filmmaker Roger Hill. The film has been screened in over 20 international film festivals and is being prepared for wider public release this year. 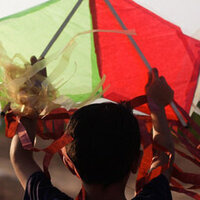 Flying Paper is the uplifting story of Palestinian children in Gaza engaged in the fascinating culture of kite making and flying as a form of creative resistance. The film follows Musa, a charismatic teenaged kite-maker in the village of Seifa, and Abeer, an aspiring young journalist in the Jabalya refugee camp. They join a remarkable quest, along with thousands of other children, to shatter the Guinness World Record for the most kites ever flown. This unique documentary includes animation and hand-held footage shot by youth in Gaza trained by the filmmakers. The event will include a talkback with the co-directors, supervising editor Rafael Parra (faculy, School of Media Studies), and moderated by an invited filmmaker. Nitin Sawhney, PhD, is assistant professor of Media Studies at The New School. His research, teaching and creative practice engages the critical role of technology, civic media, and artistic interventions in contested spaces. He examines social movements and crisis contexts, though forms of creative urban tactics, participatory research, performance and documentary film. Since 2006, Nitin co-founded a nonprofit initiative Voices Beyond Walls to conduct digital video and storytelling workshops with youth in Palestinian refugee camps in the West Bank and Gaza. Nitin recently began a participatory media project, Zona Intervenida, focusing on genocide, memory and body through site-specific performance interventions in Quetzaltenango, Guatemala. Roger Hill founded the Documentary Production Collective MentalRev Productions (www.mentalrev.com). Hill directed MentalRev's first feature length documentary Struggle, a film on voter suppression and election rigging in US Presidential Elections. Struggle was chosen by Link TV as their featured documentary in the months leading up to the 2012 Presidential Election. Roger and MentalRev Productions have produced several short films, several of which have aired at film festivals around the world. Hill has toured with his films in cities across the United States and worked as a trainer with the Voices Beyond Walls participatory media program in Gaza during the summer of 2010. Rafael is a two-time Emmy award winning editor, a faculty in Media Studies at The New School, and co-founder of Timeline Film and Video, Inc., a production and post production company in New York. His clients include: Public Health Solutions, Bravo Group (Young and Rubicam) Sesame Workshop, VIDICOM, and the United Nations. Parra has worked on all film and video genres including fiction, documentary, news, and commercials. Mr. Parra has been sharing his experience in digital media with university students in the Masters Program in Media Studies at the New School, teaching graduate courses in Aesthetics of Editing and Digital Video Editing for Documentary. Among his most salient work is the Sesame Street Series, Disney’s “Out of the Box”, ethnic documentary Panchita, the Weaver featured in the Margaret Mead festival and numerous short-form pieces and documentaries for the United Nations Development Program (UNDP).